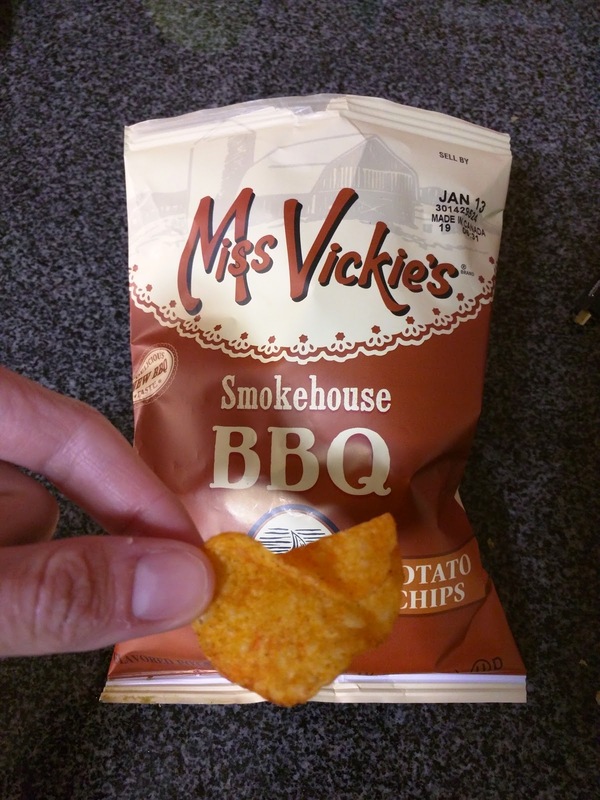 Another day, another review of chips, this time kettle style chips, from Miss Vickie's. 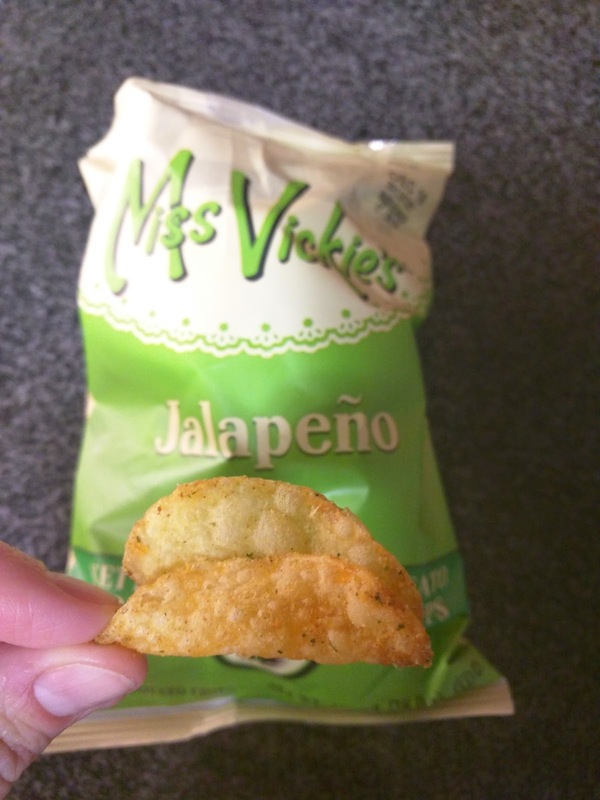 Miss Vickie's is a Canadian company, but owned by Frito-Lay, whose chips I've reviewed before. They actually have a cute story. 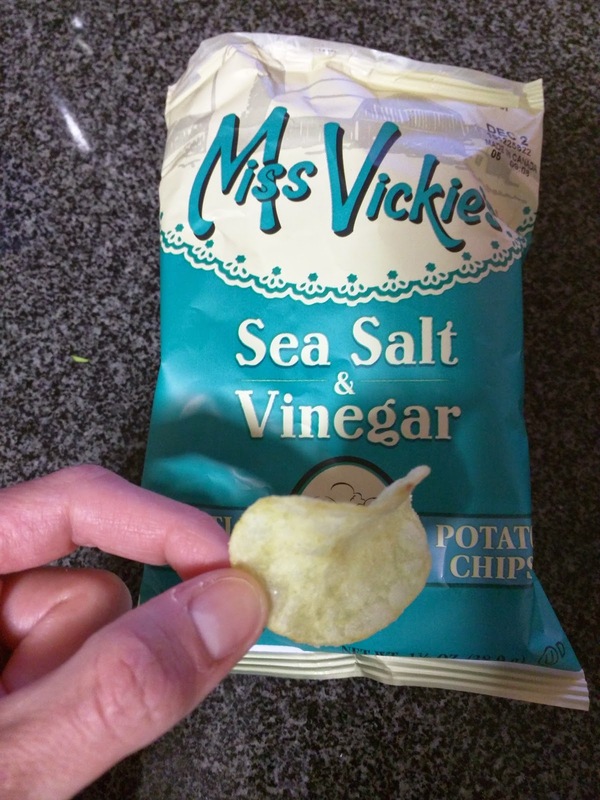 Vickie (and her husband) started making chips in Quebec at a potato festival in the late 1980s, and they became a hit. They developed popularity, commercialized, and expanded throughout Canada. A few years later, they were purchased by Frito-Lay, and are now distributed in the US. Fairly humble beginnings and a nice little success story. Anyway, the chips. I've never found them to be awesome, just basic kettle style chips, not much different from Kettle Brand or Dirty Chips, and not available in ridiculous unique flavors like Zapp's. Basic kettle style chip. Very crispy, fairly oily. The salt and vinegar flavors weren't nearly strong enough. Meh. Again, basic kettle chips. These seemed a bit burnt though, much darker in color and with some brown edges. While the salt & vinegar lacked in flavor, these made up for it. Each chip was generously coated in seasoning, and they had some kick. I didn't particularly like the flavor, but you can't fault them for not being flavorful. Update: Just basic kettle style chips, very little jalapeño flavor, needed more zing. BBQ chips were my favorite when I was younger, although I always liked "mesquite" BBQ, not "smokehouse" BBQ. These did have a smoky, fairly classic BBQ flavor. Standard oily kettle chip, crispy. No surprises here, but nothing special either. Update: Super crisp, classic kettle chips. Good smoky bbq flavor. I used to eat a lot of cupcakes ... as in, several per week. The reason is simple: the pastry department where I work made really good cupcakes, and we always had cupcakes on Tuesdays, aka, "Cupcake Day", and usually one other time during the week as well. While cupcakes are actually not one of my favorite dessert items, they did a really good job, and my cupcake desires were always more than satisfied. I haven't found anywhere else in the city that even comes close to being as tasty, so I generally just don't even try anymore. But "Cupcake Day" ended when we changed pastry chefs, and even though I still don't love cupcakes, I've been more likely to try them lately, like, as you read about last week, I had to try out Sprinkle's Cupcakes. So when I found a newish cupcake shop a few blocks away in Crocker Galleria, I had to check it out. I was further intrigued, because not only do they offer standard cupcakes, they have ... savory cupcakes! I love my baked goods and sweets, so these weren't exciting to me personally, but I have friends who do not like sweets, and it would be so fun to have them try the savory cupcakes. Emil in particular has proclaimed before that there would never be a cupcake that he'd like, but maybe the "New York, New York" with its scallion, dill, and havarati custard base topped with smoked salmon would appeal? Or the "Mission", with ground beef, pinto beans, salsa, corn, and questo fresco, in a toasted tortilla crust, topped with sour cream? How adorable! Anyway, back to La Luna. La Luna was also founded by a La Cocina graduate, and I always like supporting these small incubator businesses. They also have froyo, although the machines were not working the day I visited. Cupcakes and froyo, right in the middle of the FiDi? Potential! 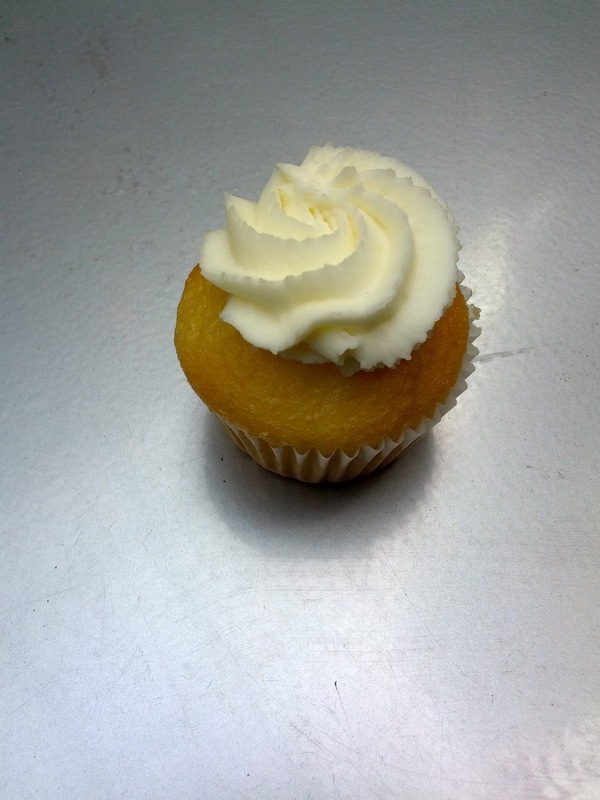 Tres Leches Mini Cupcake. $1.25. I went for their signature cupcake, the one that basically every review I read of the place praised, and the staff member told me was the best. Described as "vanilla cake filled with three different kinds of milk and cream frosting". The cake was very moist, as you'd expect from a tres leches. It almost seemed as if it were filled with cream, but I believe that was just the tres leches effect. The frosting on top had a slight citrus flavor to it, and was creamy. Nothing at all to complain about here, just a really nicely done cupcake. $1.25 for a mini was a great price, and a very friendly size. Honestly, if I worked close by, I'd probably be swinging by for a "little treat" regularly. Update: I attended a brunch, and someone brought a batch of these. I again loved the moist, almost custard-like filling due to all the milk. And the frosting was perfect, not too sweet, just sweet enough. I may or may not have had two that day ... because, mini cupcakes don't count, right? Ok, yes, I'm reviewing a sausage place. I know, not my normal stomping grounds. But, Ojan has been craving sausages, and I recently learned that Rosamunde also sells the sausages raw, for you to take home and cook yourself. So I decided to surprise him, and went to pick up some sausages. Rosamunde has two locations in San Francisco, the original in the Haight, and a newer, much larger, one in the Mission. I've known about Rosamunde for years, but sausages and beer aren't very high on my list, so I'd never been. The Haight shop is tiny. As in, no tables, and only a handful of stools along the perimeter. Most people seem to get their sausages and go eat them next door at Tornado, with beer of course. The counter displays the fresh sausages, each labelled so you can see them before you order. The sausage line up is fairly impressive, 15 or so varieties, some mild, some spicy, featuring standard beef, pork, veal, chicken, and lamb, and of course some vegan ones, as it is San Francisco after all. But for the more adventurous, there are also sausages made with duck or even boar. Besides sausage, the only other items sold at the Haight location are pickles, chips, and potato salad. There is just absolutely no space for anything else. Behind the counter is a single employee, busy taking orders, ringing people up (cash or Paypal only! ), and cooking the sausages, all at once. It is an impressive operation for one person to run, and she does an incredibly job, but quite honestly, they really suffer from the setup. By contrast, the Mission location is a full restaurant, with seating inside and out, on the sunny Mission sidewalk. They also serve brunch and have a few extra sides, like soup and fries. There is a full kitchen in the back, a pickup window where your number is called when your order is ready, and a separate counter and register to order at (also cash or Paypal only, although there is an ATM inside). I greatly prefer stopping by this location. 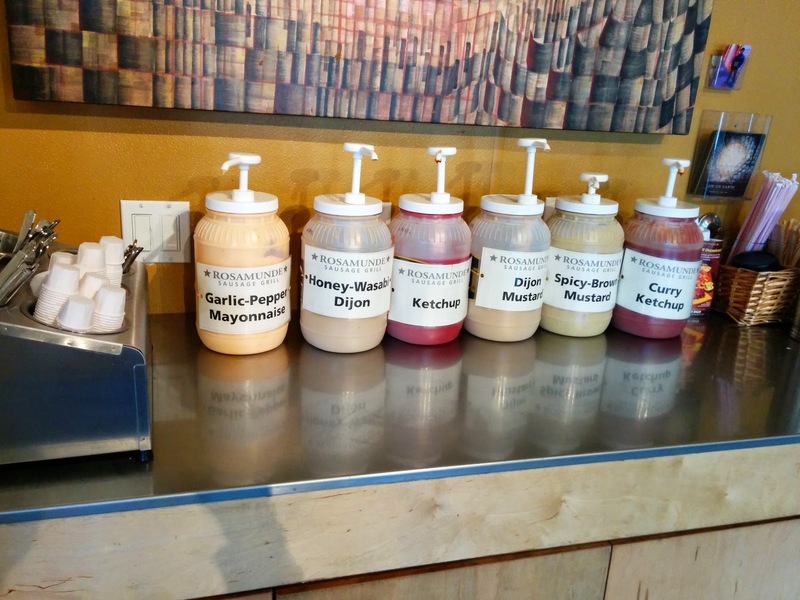 Both locations have a plethora of condiments, including several different mustards and ketchups. I'm guessing they are house made? Curry Ketchup: Interesting flavor, and I think it would be too much for a sausage, but it was actually pretty tasty. Honey-Wasabi Dijon Mustard: It had a slight wasabi on the finish, yet a pleasant sweetness to it. Nicely balanced and interesting. Garlic-Pepper Mayonnaise: I didn't actually taste garlic or pepper, but this was really tasty. I guess that could be just me loving mayonnaise, but, it was really creamy and flavorful, just not in the way I expected. Spicy Brown Mustard: Just standard spicy mustard, with a slight grit to it. I think the assorted condiments would best be utilized on fries, which only the Mission location serves. I was there just to pick up some sausages to grill at home later, since Rosamunde sells them raw. 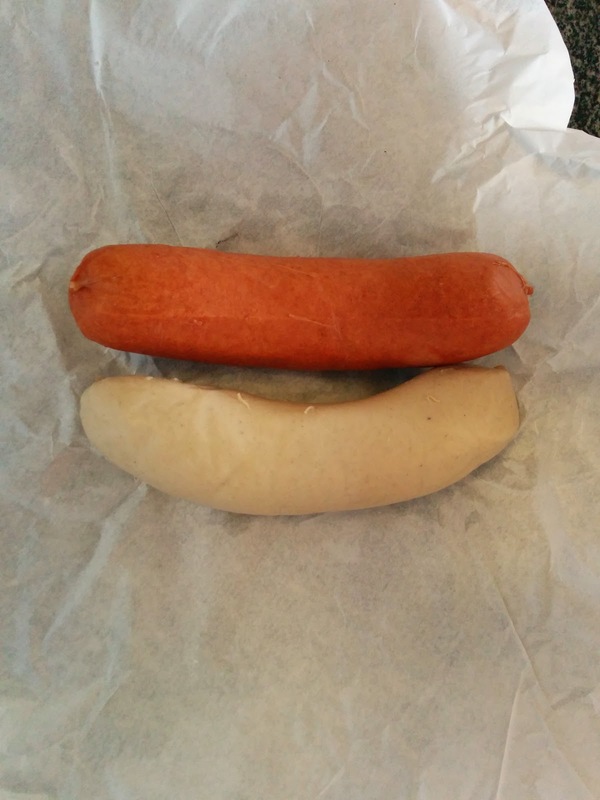 The pale one was the weisswurst (veal, onion & leek). I picked this one because I wanted to taste the additional ingredients, but I really didn't see, or taste, any onion or leek inside. It was too subtle for me. The flavor was overall very mild, and it sorta reminded me of pork, which I don't care for. It was very juicy and plump however, and perhaps if I liked veal, I would have liked this. Each sausage was huge, and Ojan and I decided to split one, since half a sausage, a full bun, and all the sides were were having was a large enough meal. I understand a bit now why they don't have additional side dishes at the store, as they aren't necessary with sausages this big. Of course, I had already planned a cole slaw and spinach and cauliflower salad to go with our sausages, before I saw how huge they were. They stayed nice and plump when cooked, which I think the large size really helped with. I left the all beef knockwurst for Ojan to eat another day, and didn't try it myself. $2.50 for a huge sausage was fine, as is the price of $7 at the store, where they are cooked for you, with a bun and two toppings. Hungarian, with grilled onions and sweet peppers. $7. On one visit, I was with Ojan, who wanted to get a sausage to eat right there. He picked the Hungarian, a classic smoked pork with garlic sausage. 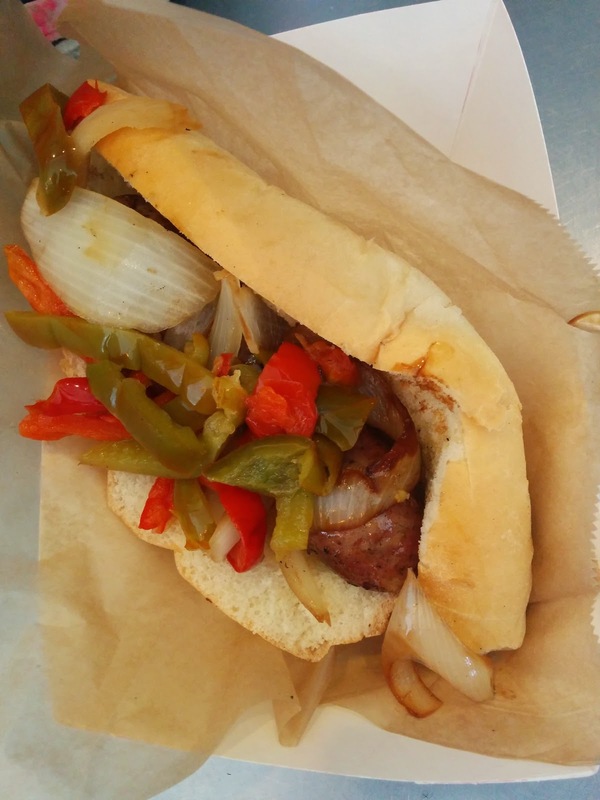 When you get a sausage to eat either store, 2 toppings are included, and you can pick from sauerkraut, grilled onions, sweet or hot peppers, or beef chili. He went for onions and sweet peppers. The sausage was nicely grilled, juicy, with a great char on the outside, as you would expect, but it was far too porky for me. I'd never pick a pork sausage, but Ojan really enjoyed it. The bread was a fluffy white bun, slightly grilled, but not buttered or anything, so it didn't brown up very nicely. The onions were soggy, the peppers unremarkable, both pre-cooked in large batches. I clearly wasn't into this at all, but Ojan really liked it. $7 price was reasonable for a made to order fancy-ish sausage with toppings. 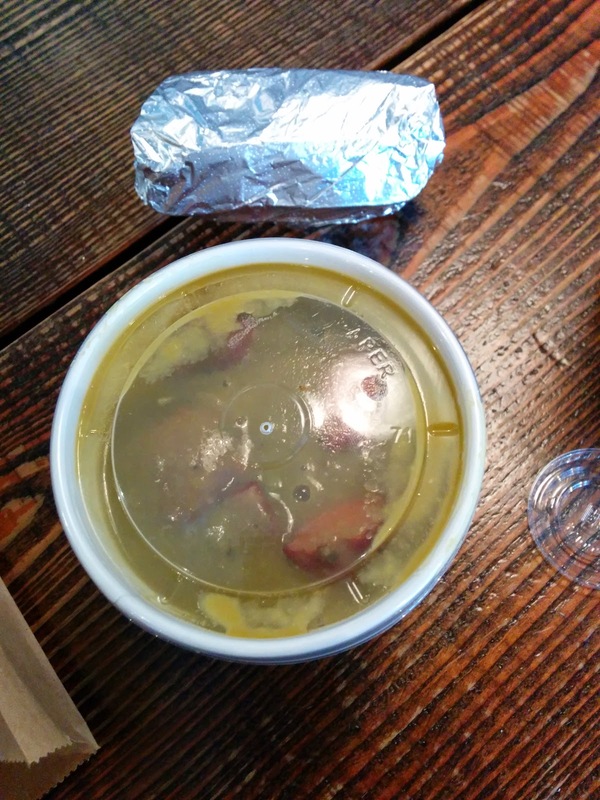 Split Pea Soup with Knockwurst. $6.50. When I visited the Mission location, it was to pick up split pea soup for Ojan. They had two varieties, vegan, or, with knockwurst. Since I was at a sausage shop, it seemed only appropriate that I'd get the one WITH the sausage. I assumed they'd just scoop out some soup and I'd be on my way, so I was a bit surprised that my order seemed to take just as long as the ones for people who were ordering sausages. And then I realized why: the knockwurst wasn't already part of the soup, they actually grilled one fresh to order, then chopped it up, and added it to the soup. I'm guessing you could easily ask for a different type of sausage if knockwurst isn't your thing. I of course snuck a taste, even though I don't really like split pea soup, because uh, I hate split peas. It was ... split pea soup. Puree style. It tasted like split peas, and little else. Since I don't really care for split peas, I didn't care for it. I personally would have liked some cubes of carrots at least to break up the pea-ness of it, and far more salt and pepper, as it seemed very underseasoned. The knockwurst however was grilled to perfection. Plump, juicy, moist. A shame to drown it in this soup! The soup was served with a side of sliced up pieces of bread, I'm guessing the same bread they use for the sausage buns? Anyway, I certainly wouldn't get this again, but if you like split peas, then perhaps this soup is for you. The vegan version is $5.25, which seems high for just a bowl of soup, but with the knockwurst it is $6.50, which is reasonable since it had a full sausage inside, cooked to order. German Baked Beans (vegan). $3.75. On my next visit, while picking up sausages to grill at home, I also got a side of the baked beans for Ojan. 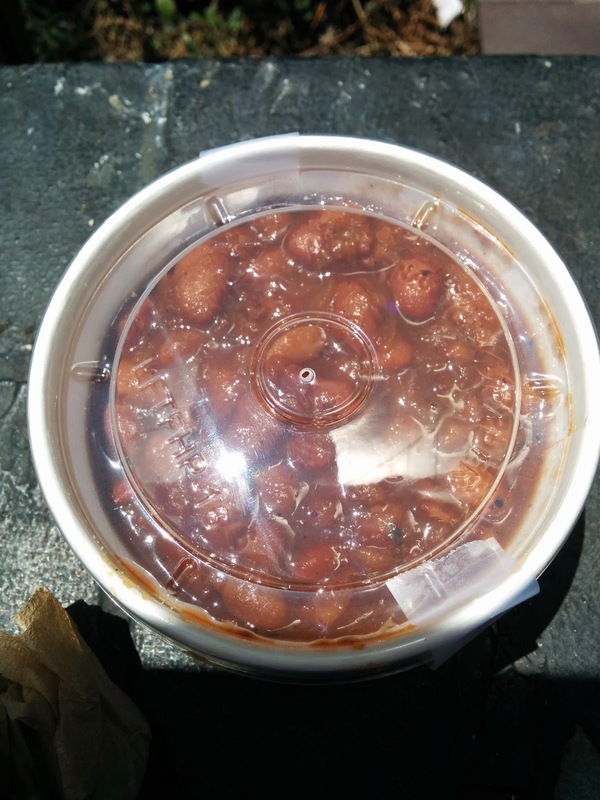 I don't really like beans, but, I wanted to at least give them a try, so I took a few bites before delivering them home. To be fair, every once in a while I really like baked beans. I'm weird though, I really like my baked beans cold. And uh, generally, from a can. Sometimes, I'm not the classiest gal. Anyway, these were served warm, small sized beans, all the same variety. Ojan jokes that I don't actually like baked beans at all, I just like the sugar sauce. I think he may be right. These weren't nearly as sweet as I'd like, so, I didn't like them. And they had a really odd spicing that I couldn't quite pinpoint. I really didn't care for them at all, and certainly wouldn't get them for myself again. $3.75 for a reasonable size side dish was fine. I couldn't resist also getting pickles. 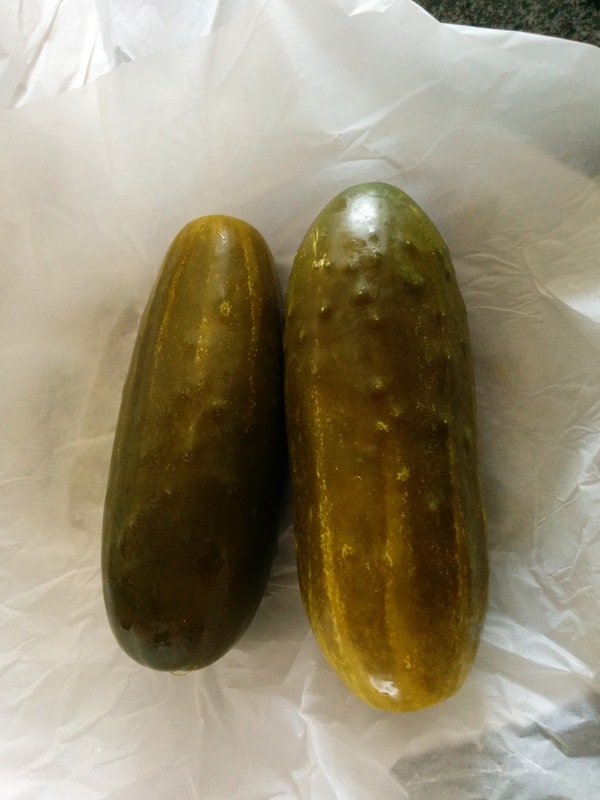 I adore pickles, and grew up with homemade pickles of all varieties, made by both my mother and my great-aunt. I've been pickle-spoiled my whole life. Those ridiculous things sold in supermarkets, that come as strangely fluorescent green spears, are NOT pickles. It doesn't matter how many jars I bring back to San Francisco with me every time I visit, we go through them way too quickly. I force Ojan to ration them. So, whenever I see house made pickles, I give them a try, as it would be great to find a source of pickles a bit more local. Along with just classic dills, I've also tried pickle plates at Wise Son's and at Il Cane Rosso, but I still haven't found anywhere I love. These were huge monsters. The person taking my order offered to slice them for me, but I declined, assuming they'd keep better whole. I cut into one literally the moment I walked into my house. And ... it was a good enough pickle. Vinegary, but not too much. The one thing I didn't like is due to their large size, they were filled with tons of seeds. Very, very, seedy, which I don't care for. These were enjoyable, but no replacement for the varieties that my family members make. I'll have to keep looking. $2 a pickle seemed a bit high, but they were huge, and I honestly have no idea what pickles should cost, as they aren't an item I normally buy commercially. On a recent visit to the Boston area to see Ojan's family, we were looking for a easy dinner option that would please everyone in the group. For some reason, the topic of sushi kept coming up. I had a list of sushi places in Boston that I wanted to try, including Uni Sashimi Bar, the sister restaurant to O Ya, which was my top dining experience of 2013. But we were in the suburbs, not Boston proper, and venturing into the city was out of the question. One place on my list was Oishii Sushi. Their famous location is in the South End of Boston, but they also have a restaurant in Chestnut Hill, not far from Ojan's sister's house. It turns out I had been there once before, years ago, but I didn't particularly remember much about it. But reviews were solid. Unfortunately, it is a small sushi bar, with a counter for about 10 people and only 1-2 tables. There is no way our group could be accommodated there. So we ordered takeout. I know, I know, the horror. 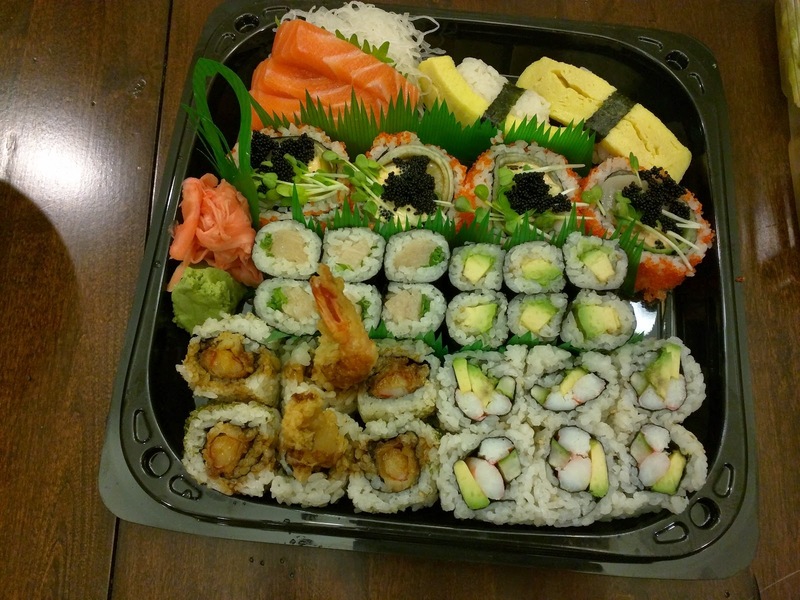 I'm never a huge fan of takeout in general, and was highly skeptical of takeout sushi in particular, but we did have the precedent of great sushi takeout from Roka Akor in San Francisco once, so we went for it. Oishii's website even had a takeout specific menu, and reviews mention a steady takeout business. It had potential. Ordering over the phone was easy enough, and our order was ready on time. The staff were very friendly, and even included a bonus dessert for us as a holiday gift - two absolutely huge asian pears (incidentally, the asian pears turned out to be quite delicious and were my favorite part of the meal). As for the rest of it? Highly mediocre and incredibly overpriced. I will not return. We started with seaweed salad. It was completely generic, and quite overpriced. 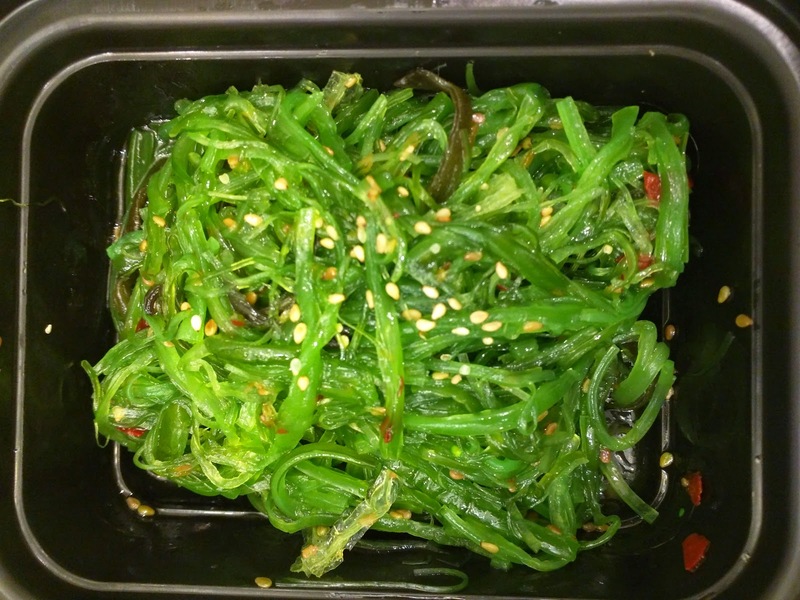 $7.95 for a regular sized side of seaweed salad? Certainly nothing special, and would have made more sense priced a few dollars less. Salmon Sashimi ($9.50), Tamago Nigiri ($5.85), Spicy Scallop Roll ($13), Avocado Roll ($4.88), California Roll with real crab upgrade($9.95), Shrimp Tempura Roll ($8.50), Negihama Roll($5.85). I was excited for the sushi. It had been ages since I had good sushi. Given the prices, and the good reviews, I expected it to be decent. I was incredibly disappointed by the sushi. I didn't try the salmon sashimi since it was ordered for one specific person, but 3 slices for $9.50 was a bit pricey for that area. It looked fine, but I can't really imagine having sashimi not fresh. The tamago nigiri was my request, since I use it for "dessert" whenever I visit a sushi restaurant. It was actually pretty good. The rice was firm, the tamago had a mild sweetness to it. No one else wanted to even try it, so I got the pair. Price of $5.85 was fine and I was quite happy with this. My other request was the Oishii special Spicy Scallop Roll: "scallop, black tobiko, cucumber, kaiwali & spicy mayo". Only 4 pieces, but all quite large, although I'm not sure it justified the $13 price tag. The scallop inside was huge, full scallops, but they were not flavorful and quite slimy (although I guess that is expected with raw scallops?). I was hoping to taste some of the sweetness of a fresh scallop. I didn't care for the roe on top either, and this really didn't come together at all for me. Since I'm allergic to avocado, I skipped the avocado roll. I did try a piece of the California roll and just poked the avocado out of it (my allergy isn't that severe). It was nothing special. We paid the upgrade for real crab as opposed to crab stick, but I honestly couldn't tell it was real crab, it wasn't a shredded style that I somewhat expected, and honestly seemed like it could be compressed crab stick. $9.95 for this small roll was overpriced. I also didn't try the shrimp tempura roll, since the idea of soggy tempura did not appeal. I tried a piece of the negihama, but I don't remember it at all. Even the ginger was a disappointment; Ojan commented that it was dried out and not very good. Besides the tamago, I didn't like any of this, it was all highly mediocre and way, way overpriced. I didn't take a photo of the beef teriyaki, since I had no intention of trying it when there was delicious sushi to be consumed instead. It was ordered for those who don't like raw fish. But, after being disappointed by all the sushi, I decided to give it a chance. The meat was incredibly fatty. It was a large entree portion, easily splittable by two people. There were also a bunch of mediocre veggies, all overcooked. It was served with generic rice, simple miso soup, and a very sad looking side salad. No one really seemed to like it, as it was left unfinished, even when people said they wanted more food. $26 was insanely overpriced. My weekend mornings always start with a visit to a cafe. I love to explore the city, so I always try to choose a different place every weekend to encourage me to venture outside my neighborhood. I rarely sit at home on a Saturday or Sunday morning, but last week, I was stricken with the horrible cold that seemed to plaque the entire city, and I didn't have the will to leave my bed, let alone my apartment. But I didn't know how to start my day without a delicious baked good! I pondered the contents of my freezer, where of course I did have "emergency" pancakes, scones, and cinnamon rolls stored away, and settled on ice cream (I had a sore throat, it was totally legit, right?) But an hour or so later, I realized I still wanted a baked good. I was about to pull up delivery.com to see if somehow there was someone who would bring me a baked good, when I remembered that I had just read about how Sprig was doing brunch delivery on weekends. Score. If you aren't familiar with Sprig, it is another startup in the deliver-fresh-food-to-you business. Ordering is not done in advance, it is on-demand only, and the app shows an estimate of how long it will take, usually 10-20 minutes. The menu is small, only 3 items at a time, but they operate 7 days a week, lunch and dinner, plus brunch on weekends. I mostly use Munchery for meal delivery, but Munchery *still* doesn't have lunch or weekend service, so it was time to check out Sprig. Ordering via the app was easy, just a few clicks and my order was on its way. I was a little confused if my order was actually confirmed though, as I did not receive an e-mail, and there was no order history in application. 20 minutes later, my meal showed up though, so it clearly worked. 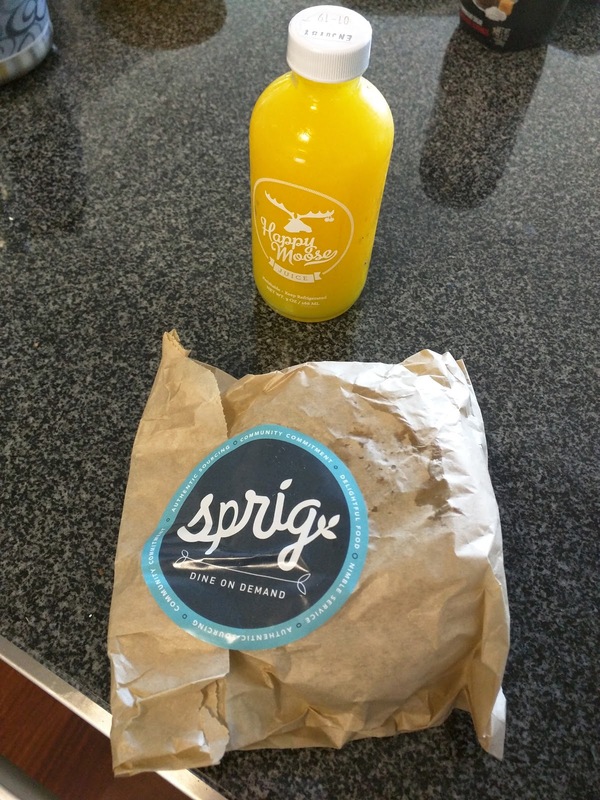 Another interesting aspect of Sprig is that they do surge pricing for deliveries. When I ordered, it was $2.75, but I've heard that it rises to $5 during peak times. While I don't anticipate needing Sprig often, it was amazing to have brunch delivered to me, and I'll certainly keep this in mind again in the future. The brunch menu featured a frittata for the egg lovers, a breakfast burrito for the hungover, and ... for me, a baked good. Yes! My meal arrived without any additional packaging, I was expecting a bag, although I obviously didn't need one. Fresh-squeezed organic orange juice. $5. Along with my baked good, I also splurged on an orange juice. Vitamin C is good for colds, right? It was fine, but, yes, just juice. I prefer more pulp in my orange juice. The glass bottle was cute, but $5 is still crazy to me for a single serving of juice (I clearly haven't embraced the juicing craze). 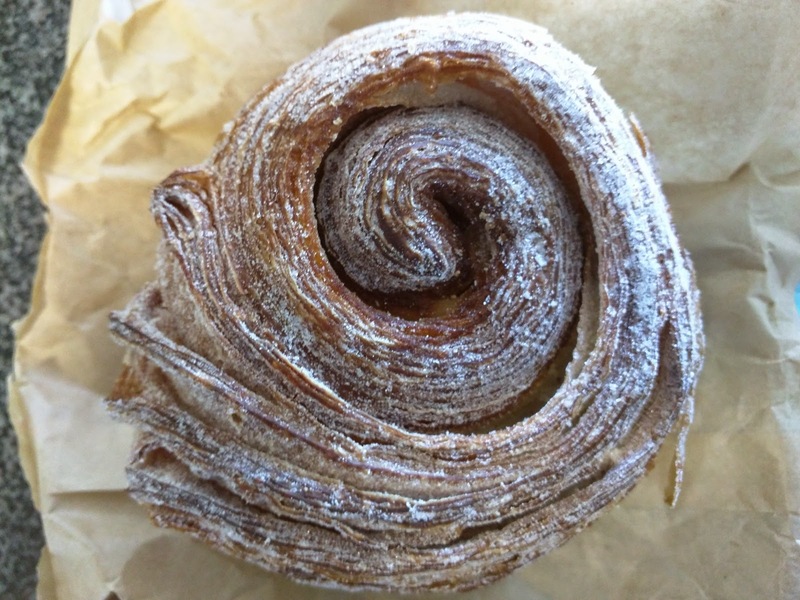 "Freshly baked morning bun with a hint of ceylon cinnamon from our friends at Fournée Bakery." And the reason I ordered in the first place. A morning bun! 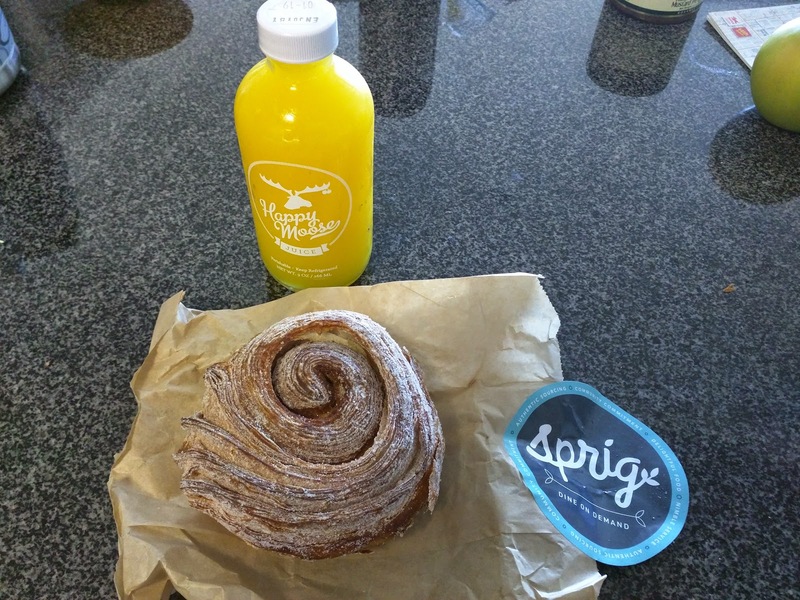 While the rest of the food offered by Sprig is prepared by their own chefs, they do outsource the morning buns from Fournée Bakery in Berkeley. I considered this a bonus - I got to try a new bakery too! Now, a morning bun is never the most exciting breakfast baked good, and I rarely choose it given other options (well, unless we are talking about the famed Tartine morning bun). In this case, I'm glad I didn't have a choice. It was great! The outside was super crispy, the inside moist. It was flaky, with a good butter content. Tons of sugar on top, slightly caramelized on the bottom. The cinnamon was very subtle, and I was expecting more, although it did say a "hint". Everything was in balance, and I enjoyed it far more than I expected. Even though it was a large size, Ojan only got a single bite, which I begrudgingly gave up. I'd definitely get another. $4.50 may be a bit high for a morning bun, but it was delivered to me, and totally hit the spot, so it was worth it. 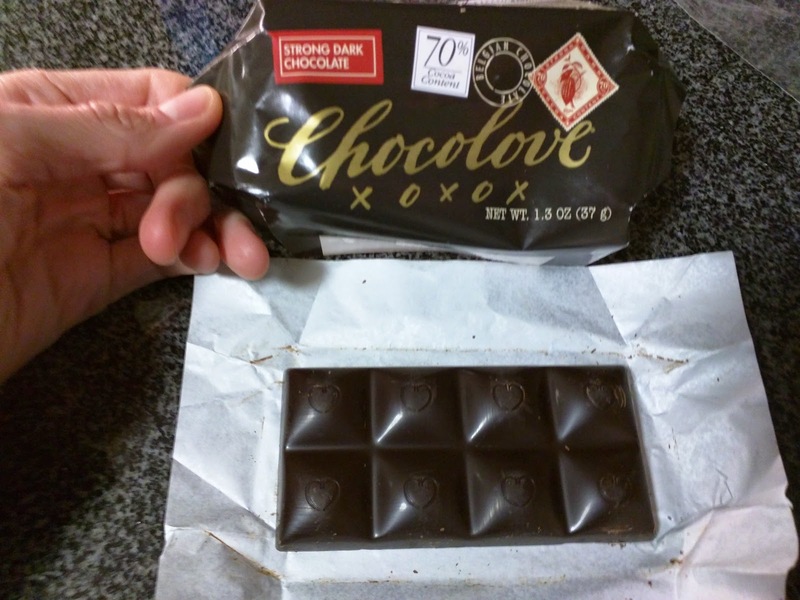 Chocolove is a chocolate bar manufacturer located in Colorado. They make 24 varieties of bars, starting with a 55% basic dark chocolate, a 65% richer dark chocolate, a 70% strong version, all the way up to extra strong (77%). They also make bars with mix-ins, like cherries & almonds, orange peel, chilies & cherries, salted peanuts, peach and pecans, and so on, in both milk and dark chocolate varieties. The bars are sold at Whole Foods, right near the registers, and many of my friends pick them up to bring to parties. I recognize the wrappers instantly. I know I've tried many of them, numerous times, but ... they have never been memorable enough to even take notes on. I feel like I've failed you a bit here, but honestly, I just don't remember a thing about them, besides that they are all generally "okay". So when I was recently given a bar, I took my job seriously, and tried to take notes. "Strong, bittersweet Belgian dark chocolate crafted to deliver an exceptionally smooth experience in dark chocolate". I went for the strong dark chocolate bar, coming in at 70%. It was ... unremarkable. The snap to the chocolate was ok. It wasn't too bitter, it wasn't too mild. But the flavor just wasn't very complex. It just ... was. I really tried to take better notes. I tried to taste subtleties, to tell you about the blackberry on the finish, or the slight earthy undertones. But there weren't any. This chocolate just wasn't interesting. Perhaps the 77% is better? And I'm sorry to all my friends who regularly buy this brand, it has just never impressed me!